Virtua Fighter Kids © 1996 Sega. Virtua Fighter Kids is based on the Sega Saturn conversion of "Virtua Fighter 2". The differences are mostly art-related : Virtua Fighter Kids' character cast are now drawn in a super-deformed style. Virtua Fighter Kids was released in March 1996. Each character has a range of facial expressions not evident in "Virtua Fighter 2". The game features some product placement : when Jacky wins a bout, he drinks from a can labelled 'Java Tea' - a famous Japanese brand name. Toshiba EMI released a limited-edition soundtrack album for this game (Virtua Fighter Kids Sound Tracks - TYCY-5520) on September 26, 1996. Alternate Costumes : Hold UP and then select your character with any button. 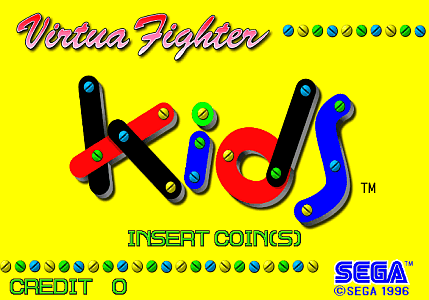 [EU] Sega Saturn (1996) "Virtua Fighter Kids [Model MK81049-50]"
Sega Saturn [KO] (1996) "Virtua Fighter Kids [Model GS-9609J]"
[JP] Sega Saturn (jul.26, 1996) "Virtua Fighter Kids [Model GS-9098]"
[US] Sega Saturn (jul.31, 1996) "Virtua Fighter Kids [Model 81049]"